I use a 1 1/2 ” hole saw for entry holes. If desired a 2″ hole for a feeder dish can be added on top. The feeder dish is also from Walmart, in the condiment section: $.25 to .49 each. Don’t have them, afraid of power tools… ask your neighbor or guy at Menards or Lowes to drill it for you. The tunnel hide or shedder assistant can not only supply hide comfort, but offers an effective surface inside and out for Mr. or Ms. Gecko to rub on when in shed. Get some PVC plastic pipe obtained at any Lowes, Home Depot, Menards, Lumber or Plumbing Stores. They will cut it in half and to the length of your choosing, not a problem. Prices vary per size, but sometime free scrap is available, just ask. You can paint if you wish. Use primer, top coat, sealer and a color of your choice. You can ask the paint department for materials to use that will work with PVC. Another idea, as shown in the photo…..material glued to exterior of tunnel may be attractive. Spray adhesive can also be used, with your choice of cloth material from a fabric store. Once again scrap material may be available. Project #3 : Hi-ways,sky-ways,geck-ways, you name it. Here is a useful but no-effort item. Purchase these at the Lowes, Menards, Walmart,etc. They can be found in the tile section and come in many designs to choose from. These are counter-top or wall tile strips. They’re held together by a nylon or other material fabrication. For the best deals, I look for stock that has been discontinued and I get the remaining sample pieces for a low price or for free. These tile strips flex, bend, etc. so they are ready to work for you as you wish. Take salsa bowl (as pictured, which can be purchased from Walmart or any other similar store) turn upside down and drill a 2″ hole for entry. Put 4×4 tile on the floor of the tank. Set the salsa bowl now as a hide (or outhouse) on top of tile. The gecko will enter and poop. I find many prefer doing the job inside this way. Poop done in this way is hidden so the tank always looks cleaned out. Here is a real easy one and sometimes “no cost.” Do you know where there is a landscaping company? Or maybe a lawn and garden shop? A little stream? Be careful on this one…A neighbor’s yard? 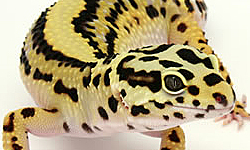 Landscaping your habitat is easy and plenty of fun for everyone, including the gecko. Just pick up rocks and stack them. (Be sure the rocks are safely stacked so they won’t fall over and harm the gecko.) Some really nice stuff may cost a couple of bucks. The photos below will give you some ideas as to what I’ve picked up, including items from the neighbor’s yard. This project may require some help from someone with a high pressure washer (otherwise known as a power washer that uses a high pressure jet of water to strip or clean a surface). Nicely shaped fieldstone can usually obtained from a landscaper or the landscaper’s supplier, a sand and gravel business. They normally have plenty of great shapes to choose from. Use a power washer to hollow out the underside and you can make the most interesting natural looking hides and decorations for your geckos. This is an easy project if you have access to the machine which may be for rent at places. The photos show both sides of each hide. Find a Hobby Lobby or similar type crafting store. In the wooden project area where they keep wooden type boxes you should be able to find an item like the one pictured below, complete with glass sides and a hinged top (approximately 7 1/2″ x 6″ x 5″ ). I took the box apart and replaced the glass sides with the same sized piece of plexiglass. The plexiglass was drilled with a 2″ hole saw. The hole is drilled high enough to keep bugs in but low enough for the gecko to peek or crawl into the box. It’s possible to cut the original glass with a glass-cutter, but I preferred to go the plexiglass route. Want to put a little color in your habitat? 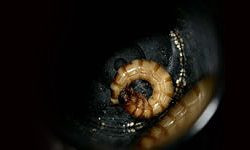 Want to help your critter keep from “hanging up” in the floor covering carpet? Notice I said “help”, not “stop”. There are fewer loops in cloth upholstering material and more colors to choose from. My friend retiring from the auto upholstering business caused me to look into this. That’s right, he gave me lots of his fabric. 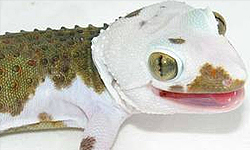 I find it not only makes habitats more attractive but geckos have less hang-up time with their claws or teeth, as compared to repti-carpet. Water dishes make me think of two things: hydration and safety for the drinker. I try to keep a endless supply of water so I tend to use fairly large bowls. I put pebbles in them to keep mainly the youngsters from getting stuck head first. The pebbles will save the life of many a prey food as well. Since I am using larger bowls, I make a built-up ledge from slate, flat stone, or tile. This allows the gecko to crawl up and rest at the water level. Great ideas! One of the best articles on Gecko Time by far. Very helpful. These are all great tips! Something that’s becoming more popular are foam pipe insulation. It’s not exactly pretty, unlike your examples, but it’s a cheap and very very easy way to create wide “branches” for arboreal geckos, such as crested geckos. this page was really helpful with some great ideas. please do more pages like this!!!!!!!!!!!!!!!!!!!!!!! I have to say……What a great read and video! I DID IT but never viewed it on here. I still have my ” Gecko Dining Room “……you have yours? Hi i was wonder if elmers craft bond spray adhesive is ok to use its acid free. I needed a glue to attach moss to one of my terrarium hides so i used it then i got scared it will hurt my geckos. Ive had it airing out for 3 days now. Is it safe yet or should i wait a few more days please someone let me know what you think k should do. You will notice that it’s mostly concerned with people inhaling the spray, or putting the container near a flame and causing it to explode. tire’s a little info about it’s lack of danger when it’s inert at the bottom of page 6. If you’re still not sure, you could always contact the company. Elmer craft bond spray toxic to gecko? Many different types in each brand. If you used it already and still want to house prized geckos. What I have done in the past. Allow as much time before entering geckos. In the meantime house a cheap pet shop reptile to see effects on it. It sounds as if you already made the attachment. My suggestion would have been to weight it to the bottom. I never used a glue spray…..
Hello, the images are not loading. I’ve checked the settings of my computer and my browser and the images still do not show on my computer, tablet or phone. Help? This is an older article. About a year ago, Photobucket, a photo hosting website, changed their policy and started requiring a several hundred dollar fee to people with photos on the site in order to be able to use the links and have the photos appear anywhere else. Needless to say, most people declined to pay this. Consequently, there are a lot of articles and forum posts that no longer have the pictures visible. I don’t think, unfortunately, that we’ll be able to get those pictures back into the articles. Sorry.